You are here: Home / Featured / What were medieval Pilgrim's motivations and gear? This was the fourth day of walking and we knew that tomorrow was a rest day. The walking had been challenging but not too tiring. A grateful pilgrim appreciates a good rest when it presents itself or is planned for. We left the efficient and pleasant Hotel L’Oustal de Parent and rejoined the GR 65 at Le Rouget. The day was overcast and somewhat chilly. The path followed an open ridge and made its way to St. Alban sur Limagnole, the largest town in the area. The GR 65 entered St. Alban through the grounds of a psychiatric ward which also housed an interesting tourist office. 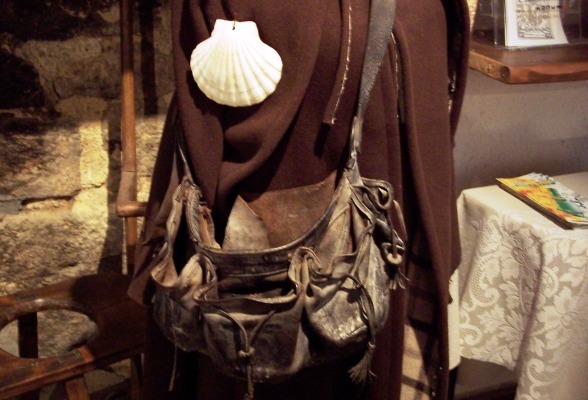 One of the tourist exhibits was a dummy dressed in medieval pilgrim’s clothes, a scallop shell, a ponderous cloak and a heavy leather bag. I want to tell you a little about the medieval pilgrim’s gear and their motivations for making these arduous journeys. In those days one important religious act available to both medieval men and women was to undertake a pilgrimage. So over the next centuries many hundreds of thousands of pilgrims made their way through France to the three major holy sites in Christendom, Jerusalem, Rome and Santiago de Compostela. The journey to Santiago de Compostela guaranteed halving the pilgrim’s time in purgatory. On the way to Santiago, pilgrims stopped at monasteries and abbeys, especially those which housed holy relics known across Christendom for their miraculous cures. Pilgrims made donations for the upkeep of the relics and this became a major source of income for the religious orders. The most powerful relics were those associated with Christ and His apostles. Paying homage to relics and minimizing time in Purgatory were not the only motivations for pilgrimage. The monastic order of Cluny elevated the importance of the pilgrimage. This pilgrimage was a journey to a new Christian self. During the eleventh century writers compared the pilgrim’s journey to that of Abraham’s from Ur to the Promised Land, or to the exodus of the Hebrews from Egypt. Throughout history, from all over Europe, pilgrims have walked to the saint’s tomb at Santiago de Compostela, passing by and stopping at shrines along the way. To prove that he had visited the holy places the pilgrim would bring back various “souvenirs” – small medallions with symbols of the holy site. It was important for the pilgrim not to tarry too long on the journey because if he had not returned one year and one day after his stipulated time, his property was transferred to his heirs. His local bishop would issue him with pilgrim’s clothes, consisting of a long dark dress of plain material, a leather bag to be hung at the waist for food and money, a stout stick with a metal point and a wide-brimmed hat to prevent sunburn. The staff represented Faith, the dress, Hope and the bag, Charity. We decided to have lunch here as coffee and fresh bread were available. Then headed back on the path into the woods. We still had some way to go before reaching our night’s accommodation.